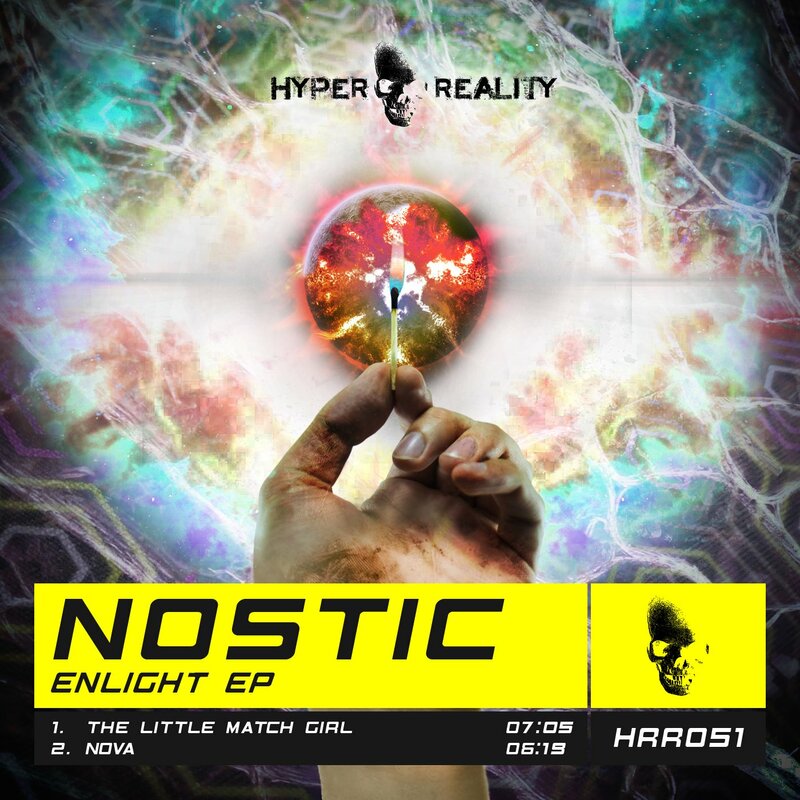 Hyper Reality Records’ label boss Nostic returns with another storming EP. Enlight features 2 tense, energetic tracks, featuring the type of psychedelic-influenced hard trance the Dutch producer is known for. First up is The Little Match Girl, which kicks things off with a throbbing bassline before introducing a hard-as-nails kick. Tension is built with eerie atmosphere and staccato synth stabs before dropping into the main breakdown, where sound effects and a vocal sample from the classic children’s story of the same name enhance the dark atmosphere. By the time the track drops back into the main theme – this time with a subtle acid line creeping away in the background – the tension is palpable, resulting in an explosion of energy. Next we have Nova, an energetic psychedelic workout featuring the kind of interplaying acid and synth lines that has been Nostic’s signature sound over the past few years. A tough kick and bassline are joined early by a wailing acid line, and gradually accompanied by off-beat synth stabs and arpeggiated harmonies. The breakdown features lush pads layered under a dirty synth line, acid, and cinematic drums, resulting in an atmosphere at once euphoric and full of tension. A quick build-up leads back into a driving, acid-fueled stomp, feeling energetic and schizophrenic all at the same time. Full of dark atmospheres, psychedelic synth work and rock-solid bottom end, the Enlight EP showcases Nostic at his very best. HRR051 is supported by ADM, Adam Mohican, Ariel Beat, Bas van den Eijken, Basebear, C.O.L.D., ConnecteD, Dark Sector, Dizmaster, DJ Danny Slade, DJ Spaceman, Ed Lynam, EnerJay, Jake Ayres, Jake Nicholls, Johan N. Lecander, Justin Wakefield, Ken Plus, Mark EG, Mindflux, Mr Trance Movement, Nick The Kid, Remnis, The Sixth Sense, Trickydj, XLS and many more.